Dr. Frederick E Dixon, MD is a Doctor primarily located in Austin, TX, with other offices in Austin, TX and Fredericksburg, TX (and 1 other location). He has 40 years of experience. His specialties include Cardiovascular Disease and Sleep Medicine. He speaks English. Dr. Dixon has received 3 awards. The overall average patient rating of Dr. Frederick E Dixon is Great. Dr. Frederick E Dixon has been rated by 58 patients. From those 58 patients 24 of those left a comment along with their rating. The overall rating for Dr. Frederick E Dixon is 4.5 of 5.0 stars. I have been a patient with Dr. Dixon for several years and he has always been very informative and helpful in reviewing any test results and what is best for me moving forward. compared to other doctors and staff i have nothing but praise. I have been seeing Doctor Dixon for a few years now. I can't say enough about him. He is very professional and kind. I love his staff. Have been going to Dr Dixon for a number of years and found him to be most professional and caring. The general office atmosphere is a a good experience. Dr. Earl Dixon is originally from Atlanta, Georgia and received his medical degree from the University of Virginia School Of Medicine in Charlottesville,Virginia. He served his internship and residency in internal medicine at Ochsner Foundation Hospital in New Orleans, LA, where he also completed his fellowship in Cardiology. He also completed a master's degree in Medical Management at Tulane University in New Orleans, LA. Dr. Dixon's areas of special interest include Sleep Medicine, Women's Heart Health (including evaluation of the pregnant patient), and Cardiac Imaging. He is board certified in Internal Medicine, Cardiovascular Diseases, Nuclear Cardiology, and Sleep Medicine. 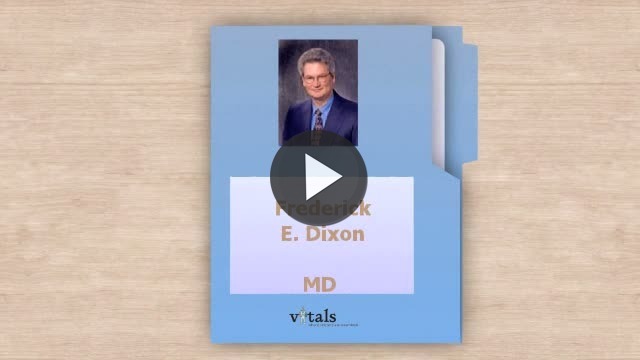 Take a minute to learn about Dr. Frederick E Dixon, MD - Cardiovascular Disease in Austin, TX, in this video. Dr. Frederick E Dixon is similar to the following 4 Doctors near Austin, TX. Have you had a recent visit with Dr. Frederick E Dixon? Select a star to let us know how it was.